Over the course of 1995-1996 CE, the Armed Islamic Group (GIA) alienated many people who had come under its banner inside Algeria as well as many supporters abroad. The GIA's amir Djamal Zitouni (Abu Abd al-Rahman Amin) was assassinated by elements who had turned against the GIA. In his place came Abu Talha Antar Zouabiri (/Zawabiri), who did nothing to improve the declining reputation of the GIA. In September 1996 CE, the GIA's magazine publication released an issue featuring an interview with Zouabiri. This interview should be considered a key text in the history of the GIA for a number of reasons. Arguably, the central point that Zouabiri emphasizes is that the defections from the GIA have not harmed the group, but have rather supposedly increased the GIA's determination and helped expose those who were not sincerely committed to the jihadi cause, which cannot entail any dialogue or agreements with the Algerian government. Meanwhile, the jihad will continue so long as religion does not wholly belong to God- a reminder that the GIA's ambitions were ultimately global in nature. The transnational nature of the GIA's goals was also embodied in the ambition to establish a Caliphate, which is mentioned on two occasions in the interview. The reader should pay attention to the purpose of the interview outlined in the introduction. In hoping that the interview will heal "pains of doubts," the GIA was clearly aware that it was floundering and that many who would have otherwise supported the GIA had developed doubts about the group. As becomes clear from the first question put to Zouabiri, a common criticism directed at the GIA was that it had become a group of Khawarij (referring to a trend in early Islam that has now become synonymous with extremism and excessive takfir against those who declare themselves to be Muslims). 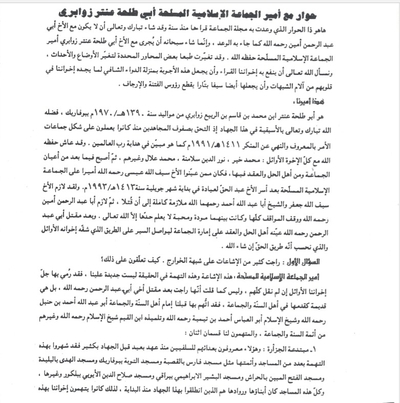 In keeping with the views outlined in the GIA's manifesto Hidayat Rabb al-Alimeen that was released under Zitouni's tenure, Zouabiri emphasizes the Salafi character of the GIA and distances the GIA from the al-Hijra wa al-Takfir (/al-Takfir wa al-Hijra) trend that had originated in Egypt and was criticized in the GIA manifesto as embodying a Khawarij trend. However, while responding to the Khawarij criticism directed at the GIA and mentioned in the interview, Zouabiri also offers some insight about the earlier composition of the GIA. Though he insists the GIA was always a Salafi and jihadi-led group, he notes that some people who did not identify with that trend had come under the GIA's banner, including those of the nationalist Islamic trend of Djazarism. As Zouabiri explains it though, these Djazarists were infiltrating the GIA, but then the GIA supposedly discovered their plot and thus fought and killed them. Interestingly, the Islamic State Movement- one of the groups that broke ranks with the GIA- claimed in a March 1996 CE that Djazarists were among those who had taken over the GIA's leadership. Another criticism of the GIA was that the group had little regard for the killing of civilians- a subject addressed in the interview. Zouabiri's line of argument is that the GIA does not intentionally kill Muslim civilians in its attacks. For instance, in preventing youth from moving about between the areas, the aim is not to kill civilians but to kill Algerian reservist soldiers who might otherwise not be distinguished from the general population. For the discussion about whether attacks can be launched against non-Muslim/apostate targets in the knowledge that some Muslim civilians might be killed in the process, one should compare with Islamic State figure Abu Malek al-Tamimi's "Nigerian Questions," which addresses a query from the West Africa Province affiliate on the same topic. In short, so long as there is no intention to kill Muslim civilians, it is acceptable to launch attacks against targets where the enemy might be using Muslim civilians as 'human shields' and so those Muslims might be killed (e.g. because the enemy holds Muslim hostages, or Muslim civilians happen to dwell in proximity to the enemy targets in the cities). This approach is justified on the principle of pursuing the lesser of two evils. Of further interest is the question of the GIA's relations with other jihadist groups abroad. It should be remembered that by the time this interview was released, Osama Bin Laden (OBL) had ceased to deal with the GIA. OBL, however, receives no mention in this interview. Instead, Zouabiri is asked about Egyptian Islamic Jihad (the "Egyptian Jihad Group" as described in the interview) and the Libyan Islamic Fighting Group (LIFG), both of which distanced themselves from the GIA. Zouabiri's response partly attacks both groups as ideologically deviant: Egyptian Islamic Jihad is portrayed as partisan for Sayyid Qutb (an Egyptian Islamist thinker who promoted the idea of a 'vanguard' to lead the fight against the 'Jahiliya' prevailing in the Muslim world) while the LIFG, which launched an unsuccessful insurgency in the 1990s to overthrow Qadhdhafi's regime, is characterized as closer to the Muslim Brotherhood's thinking as well as being partisan for Sayyid Qutb. The final concluding remarks of the interview can be summed up as a call to bloodshed and massacre, unleashing the wrath of the GIA against the 'renegades/traitors' and the 'apostate' government and its supporters. It is thus hardly surprising that the GIA continued on its bloody path and went into further decline. Below is the text with translation. This is the discussion the Jama'a magazine promised its readers a year ago and the Blessed and Almighty willed that it would not be with the brother Abu Abd al-Rahman Amin (may God have mercy on him) as the promise came, but rather the Exalted willed that it would be conducted with the brother Abu Talha Antar Zouabiri the amir of the Armed Islamic Group (may God protect him). And of course some of the defined topics have changed on account of the change in the situations and events, and we ask God Almighty to benefit our reader brothers through him and that He make these responses as the healing medicine for what our brothers find in their hearts from the pains of doubts and that He also make them a sharp sword in cutting the heads of fitna and irjaf. He is Abu Talha Antar Ibn Muhammad bin Qasim bin al-Rabi' Zouabiri born in 1390 AH/1970 CE in Boufarik. God- Blessed and Almighty is He- distinguished him in being among the predecessors in this jihad as he joined the ranks of the mujahideen since they operated in the form of the groups to command what is right and forbid what is wrong in 1411 AH/1991 CE as made clear in Hidayat Rabb al-Alimeen. And he- may God protect him- lived with all the first brothers: Muhammad Khayr, Nur al-Din Salamna, Muhammad Allal and others besides them. Then he later became among the notables of the group and among the Ahl al-Hall wa al-'Aqd in it, for he was among those who appointed the brother Sayf Allah Eisa (may God have mercy on him) as amir over the Armed Islamic Group after the brother Abd al-Haqq L'ayada was taken prisoner at the beginning of July in 1413 AH/1993 CE. And he was wholly with the brother Sayf Allah Ja'afar and Sheikh Abu Abdullah Ahmad (may God have mercy on them both) until they were killed, then he was with Abu Abd al-Rahman Amin (may God have mercy on him) and he took all the stances and there were between the two of them friendship and affection whose extent cannot be known except by God Almighty. And after Abu Abd al-Rahman (may God have mercy on him) was killed, the Ahl al-Hall wa al-'Aqd appointed him to lead the group, that the course might continue on the path that his first brothers had cut and which we reckon to be the path of truth, if God wills. Q: Many rumours have circulated on the suspicion of being Khawarij. How do you comment on that? 1. The innovators of the Djazarists: and these people are well-known for their hostility to the Salafis since a long time before the jihad for they have thrown this accusation at a number of the mosques and their imams like the Faris mosque in Kasbah and the al-Tawba mosque in Boufarik and the al-Huda mosque in Blida and the al-Fatah al-Mubin mosque in al-Harash and the al-Bashir al-Ibrahimi mosque in Baraki and the Salah al-Din al-Ayyubi mosque in Belcourt and others besides them. And all of these mosques, their sons and leaders are those who launched this jihad since the beginning. And thus they accused our brothers with this suspicion: our brother Nasir al-Din Kahil and Muhammad Khayr and Muhammad Allal and Ali Zouabiri and Abdullah Shlala and others besides them (may God have mercy on them). And when all the doors were closed in their faces, they entered by necessity into the Armed Islamic Group with the aim of attaining their idolatrous goals as they thought that the group was an open door for them, so they kept silent about our being charged with this suspicion when they were in our ranks. But when our brothers discovered their plot and killed their heads, they revolted against the group as they had failed to proceed in their plot and deception. Then they returned to accusing us with the accusation of al-Hijra wa al-Takfir and Khawarij as they did before. So it is no surprise then that this innovating, heretical sect accuses us as such, as this is the custom of the people of innovation with the Ahl al-Sunna as is well-known and established. 2. The hypocrites who are ill of heart: and these people have no resolve over a matter as is the case of the hypocrites, for they were accusing the Armed Islamic Group of the innovation of the Djazarists and that was after this latter sect joined the group, and after the group began to fight these Djazarists and killed their heads when their plot became apparent as previously mentioned, these hypocrites began to condemn us for killing them and fighting them and defend them. Then they went to characterize us with this innovation: the innovation of the Khawarij and al-Hijra wa al-Takfir, which has resembled their hearts, and refuge is to be sought in God. Then after that they concocted manifest, trivial suspicions by which they establish these accusations of theirs and justify through them their going out from the group. The truth is that these hypocrites rather went out from the Armed Islamic Group with the intention of returning to the Salvation Front and its idolatrous work and sit at the table of dialogue with the apostates, for one of their heads has set a meeting with the head of a provincial office for this misguided, misleading party. Then they think that the path to settle the matter with the apostates is dialogue and this is by the witness testimony of one of them, and recorded in an audio clip. And among those suspicions with which they have charged us is the issue of takfir against Ali Ben Hadj, and for the sake of it they have created a massive stir. And I say here that one of them, indeed their head, declared takfir against Ali Ben Hadj: this was in more than one meeting and with the attendance of a group of the mujahideen. And as for the issue of Ali Ben Hadj: we sought good from him for some time because he showed that he was Salafi, until after a number of the preachers and the brothers established the proof against him. We mention among them: Omar Alami and his brother Abd al-Nasir and our brother Abu Malik al-Eid, who was killed with the brother Eisa bin Ammar the amir of the Armed Islamic Group. I say: until after the proof was established against him, we thought good of him, and our brothers continued to correspond with him, advise him, and strive to get him out of prison as happened in the time of Sheikh Abu Abdullah Ahmad and the brother Abu Abd al-Rahman Amin (may God have mercy on them both). And it is not hidden that his name had been mentioned in a statement of the conditions in the French aircraft operation at the end of 1414 AH/1994 CE. And when his concealment of deviation and error became apparent after the appearance of the proof time and again and that was through his vouching for the Rome meeting and his vouching also for the Salvation Army, we disavowed him just as we disavowed the rest of the innovators, as we did not ever have something by which we could establish him on this innovation that leads to kufr: entering into democracy and insisting on that, and he himself would say: "If you see me deviating, don't follow me." So we have disavowed him an abandoned his error and deviation. So when our brother Abu Abd al-Rahman Amin (may God have mercy on him) took the decision to separate him from the ranks of the group, the evils of these people sick in their hearts began to appear gradually until they began accusing us of al-Hijra wa al-Takfir. Indeed they got to the point of killing our brother Abu Abd al-Rahman Amin (may God have mercy on him) because he- as their witness said in the clip- was not prepared for dialogue. And in summation: the Armed Islamic Group is a group that wishes to worship God- Blessed and Almighty is He- in what pleases the Exalted, and we will never be content to be directed by any side as the Djazarists tried to make us directed by Iran and Libya, and as some of them tried to make us directed by some of the organizations and so forth. As for the issue of dialogue and truce and reconciliation with the apostates, this is an issue on which Abu Bakr al-Siddiq (may God be pleased with him) and the consensus of the Companions was contracted on that and our sheikh Abu Abdullah Ahmad (may God have mercy on him) ruled on it just as in the first number from the victorious sect and likewise in the clip that was recorded three days before his killing and which the al-Ansar newsletter published. And we repeat it here and we say it because all that has been repeated has been established: no dialogue, no truce, no reconciliation, and no dhimma pact with all of the apostates. And this creed of ours will not change because of the barking of some of the hypocrite dogs and we will not abandon the consensus of the Companions for these erroneous, misleading people who want dialogue. Q: These hypocrites have found for themselves justifications to revolt against the Armed Islamic Group, among them their claim that it does not care about killing the general populace. So what is your response to this claim? A: These people had objectives they wanted to realize and attain, but when their thoughts and efforts were frustrated, they found and invented for themselves justifications that have no foundation in truth and among them are these lies and falsifications that are not hidden to anyone of sound heart and those lies are the killing of the general populace and whoso wishes clarification from the truth of what we say, he need only examine as SAWS said: "News is not like examination." For the group embraces the doctrine of wala' and bara' so whoso shows wala' to God and his religion and helps the mujahideen, it is a right upon us to be loyal to him. And as for the one who shows enmity to the religion of God and helps the apostate Tawagheet, upon us are disavowal of him. And we are hostile to him and fight him. And as for the one who embraces the stick from the middle, neither to these people nor to those, they are the hypocrites. So the one whose evil, kufr and wala' to the apostates have become clear to us, we must by law kill him, and this person is more evil than the disbeliever. And as for the one who shows wala' to God's religion and the believers and the mujahideen, that person is among us and we are of him, unless there appears from him what contravenes that as the rulings of Islam apply to the open. So the group does not halt in ruling on the people, whether believing in God, disbelieving in Him or hypocrites, and just as mention of these three categories came in the beginning of Surat al-Baqara. 1. Statement removing excuses and doubts for the oil workers. 2. Statement clarifying the path in prohibiting the youth from long travel. 3. Explosion operations our brothers (may God protect them) undertake. As for the first: it was issued to strike the biggest of the apostate Taghut's resources, for it is the biggest artery for their economy, for it is not hidden to anyone that these companies are the ones by which the apostates are financed in furnishing their armies and thus waging war against Islam and the Muslims. And this is not hidden to anyone who has the slightest knowledge of these apostates. And we do not rule absolutely by kufr against the workers of these companies but rather their ruling goes back to the aforementioned classification. And killing them is from the angle of realizing the predominant interest and repelling the evil corruption realized on the basis as we mentioned that among them are the believer, among them the disbeliever and among them the hypocrite. 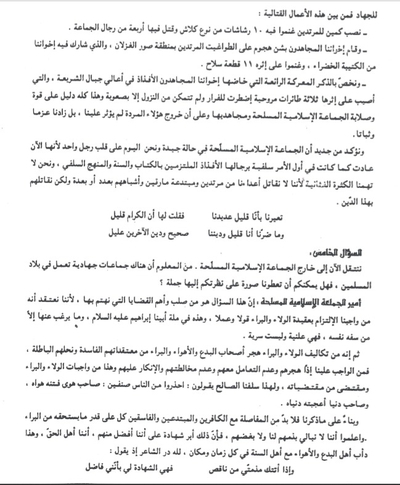 As for the second: as made plain in the statement itself, it concerns those youth who have reached the age of conscription in the ranks of the apostates, so it was issued to remove the obstacle from the mujahideen, as the reserve soldiers have been moving about without documents establishing that they have joined the apostates' army, so our mujahideen brothers cannot distinguish between them and others besides them from the youth. For this reason, we prohibited the aforementioned youth from moving through the areas, so the one we find not in his place on the basis of the conditions mentioned in the statement, we kill him. And until now, most of those we have killed in implementation of this statement, we have found them to be among the apostate reservist soldiers, and praise be to God. And as for the third matter, it is the explosion operations. The targets that our brothers strike are the centres of the apostates and in them naturally some of the general populace are hit and this does not ever mean that we have intended to kill them, and the Shari'i lines of evidence have explained the permissibility of killing the Muslims used as shields without intending to kill them and this is so regarding the Muslims taken by force to the ranks of the disbelievers, not to mention those who live with them voluntarily without compulsion. And the Prophet (SAWS) said: "I disavow every Muslim established among the backs of the idolaters" or as he said, and this does not mean that we declare takfir on the people absolutely but rather we make clear that the general populace who reside among the backs of the apostate Tawagheet are more deserving to be killed through shielding than the Muslims by whom they are shielded through compulsion, and God knows best. Q: Some of the renegades from the group announced that they deposed the brother Abu Abd al-Rahman Amin and appointed an amir over the head of the group with tazkiya from members of the Shura council. What is your comment on the news? A: This news reached us more than two days before the killing of the brother Abu Abd al-Rahman Amin (may God have mercy on him) and this is among the signs that show the corruption of their intentions and their plotting against the group and its people. And they prepared the operation to assassinate our brother Abu Abd al-Rahman and some of the notables in the group. And as for their claim that the Shura council of the group had vouched for this new amir as per their claim, it is a falsehood and lie as the Shura council never met with these people. And the members of the Ahl al-Hall wa al-'Aqd agreed that in the event of the death of the amir of the group or occurrence of what would require his removal, their meeting to appoint a new amir would only be in the area in which Radwan Abu Basir, entrusted to convene the session of al-Hall wa al-'Aqd, was present, and it would not meet in his absence. And this is what happened when I was appointed as amir of the group after the killing of my brother Abu Abd al-Rahman (may God have mercy on him). So the claim of these renegades that the Shura council or the Ahl al-Hall wa al-'Aqd gathered and appointed the claimed amir, their meeting, even if it actually happened, is not acceptable as they violated the principle agreed upon and indicated above. "And they have charged them with transgression on account of that by which the one making the charge is more deserving to pay the penalty for the deed of the criminal." Q: What is your assessment of the group after the recent events and especially the killing of Abu Abd al-Rahman Amin (may God have mercy on him)? A: If you mean the situation after the revolt of these renegades, we give them no weight and we remind you of the words of God Almighty: "God would not leave the believers on what you are upon until He should distinguish the evil from the good"- Al Imran. So the appearance of the renegades is in truth a mere tribulation, a test to distinguish the ranks even if some of the weak-hearted from the people have considered it to be fitna and hardship, and in truth it is a blessing and grant. And it is the Sunna from which there is no fleeing or escape and whoso goes out for jihad in God's path is patient, reckons, and embraces the group so long as it complies with the Book of God and the Sunna of His Messenger (SAWS) and the guidance of the just predecessors. And we do not forget that we were praying to God Almighty to rip apart the veils of the traitors and expose the blemishes of the hypocrites and reveal them. So that was by God's grace alone, so this tribulation and this testing only increased our force and solid foundation, because these renegades were the ones causing the impediment of victory and enabling as the Almighty has said: "Had they gone forth with you, they would only have increased your confusion, and they would have been active among you, seeking fitna among you. And among you are those who listen to them"- al-Tawba. And it suffices for you that they were calling for abandonment, impeding things and casting doubts to stir up false rumours among the mujahideen. And we have in the biography of our predecessors from the Prophets and those sent and the Companions and followers the greatest example, and in the story of Talut is a lesson for whoso wants to consider and in the Messenger of God (SAWS) an example in patience and steadfastness, for a third of his army turned away in the Ahad raid and that did not reduce the determination of SAWS or the determination of his companions at all. And likewise most of his army turned away in the Hunayn raid and only a few remained with him. Despite this, the victory in the end is with the Muslims. So what is the benefit for the remaining of these intruders from the innovators and hypocrites in our ranks as the evil they have brought is far greater than the good they have offered, nay, most of the fitnas that befell the mujahideen in the group? And the evidence that the group is in a good state is that our mujahideen brothers, after these events I have pointed out, managed to teach the apostate Tawagheet lessons in courage and boldness that reminded us of the first days of the jihad. - Putting in place an ambush for the apostates in which they took as spoils 10 Kalashnikov machine guns and in which four of the men of the group were killed. - Our mujahideen brothers launched an attack on the apostate Tawagheet in the Sur al-Ghazlan area, in which our brothers from the Green Battalion participated. And they took as spoils 11 pieces of weaponry. - And we note in particular the wondrous battle our intrepid mujahideen brothers waged in the highest of the Shari'a mountains, following which three helicopters were struck and compelled to flee and they did not manage to descend except with difficulty and this is entirely evidence for the force and solid foundation of the Armed Islamic Group and its mujahideen and that the coming out of these renegades did not impact us, but rather our determination and steadfastness were increased. And we affirm again that the Armed Islamic Group is in excellent condition and we today are on the heart of one man because it has now returned as it was in the beginning, Salafi in its intrepid men who embrace the Book and the Sunna and the Salafi manhaj. And we do not care for the idealistic multitude because we do not fight our enemies from apostates and renegade innovators and their likes by number or equipment, but rather we fight them through this religion. You reproach us that our numbers are few. I said to them that the noble are few. And it has not harmed us that we are few, and our religion is true and the religion of the others is ailing. Q: Let us move now to outside the Armed Islamic Group. It is well-known that there are jihadi groups working in the land of the Muslims. Can you give us a picture of your view of them in general? A: This question is of the core and the most important of the causes we are interested in, because we believe it is from our obligation to embrace the doctrine of wala' and bara' in word and deed, and this is in the path of our father Ibrahim (peace be upon him). And only the one who discredits himself loathes it, for it is a public matter and not secret. Then indeed among the responsibilities of wala' and bara' is to abandon those of innovations and whims and disavow their corrupt beliefs and false creeds, so it is obligatory upon us to abandon them, not deal with them, not mix with them, and condemn them. And this is among the obligations of wala' and bara' and one of its requirements. And therefore our just predecessors say: beware of two kinds of people: the one of whims tempted by his whim, and the one of material world who likes his material world. "If condemnation of me comes to you from a deficient person, it is testament for me that I am virtuous." 1. The jihadi groups that we do not consider from the outset as among the Muslims, like the Imamite Rafidites and the Nusayris. 2. The jihadi groups whose loyalty to the apostate Tawagheet has been established or which fight according to kufr programs and what it comes to: like the Salvation Army and its likes. So we disavow this type and we do not gather with them or work with them. And our brother Abu Abd al-Rahman Amin issued a statement about this Salvation Army and he made clear in it the group's position on it, and in sum this is all made clear in Hidayat Rabb al-Alimeen. 3. The jihadi groups that affirm affiliation with the Ahl al-Sunna wa al-Jama'a. As for these people, our stance on them is a Shari'i stance. Our loyalty to them depends on their embracing of the Book and the Sunna and the Salafi manhaj in word and deed, externally and internally, and among the most important signs of embracing that is showing disavowal from enmity and not dealing with sects and organizations of innovation, because a group that claims to bear the banner of the Salafi da'wa has no right to support or aid these organizations, because in that they nullify the doctrine of wala' and bara'. Indeed the obligation is to abandon them and condemn them even if that leads to fighting them and opposing them. As for the jihadi groups that embrace the Book and the Sunna and the Salafi manhaj and embrace the doctrine of wala' and bara', they are of us and we are of them. And we and they are one hand against those besides us from the original disbelievers and the apostates and likewise the renegade innovators we repel from each other what the murjifun and hypocrites disseminate from doubts and accusations. And there is no heed for borders or distances that separate us, for the victorious sect is not confined to one land but rather what brings us together is Tawheed that is the opposite of idolatry and following that is the opposite of innovation, nothing else. And this is the matter of our just predecessors (may God be pleased with them) for it is al-Hassan al-Basri who says: "Wish the Ahl al-Sunna well for they are in what few have proceeded, and they are least in what comes." And as it has been from the obligation on the Ummah that there should be one Imam for it under whose banner it wages jihad and professes to hear and obey him, it has been obligatory on us to appoint one Imam over these Salafi groups. And were God to allow and enable us or others besides us in one of the abodes and were allegiance to be given to a Caliph leading us by the Book and Sunna of our Prophet (SAWS) and were there to be in him the conditions of the Imamate on which the imams of the Ahl al-Sunna wa al-Jama'a have agreed, like being male, of the Quraysh, justice and other conditions, then it is not allowed for any one of us to become imam and not recognize him as imam. And we do not find in ourselves an objection to the issue of Quraysh origin but rather we defer to the command of the Messenger of God (SAWS) and we submit to him and we do not merely concede voluntarily. How could it be otherwise? For the Messenger of God (SAWS) says: "Give precedence to a Quraishi and do not precede upon it yourselves." And SAWS' words: "The imams from Quraysh, when they have judged, have been just." And the Almighty's words: "And no, by your Lord, they will not believe until they make you judge in the dispute that has arisen between them, and then they do not find in themselves an objection to what you have judged and submit"- al-Nisa'. Q: The Egyptian Jihad Group and the Libyan Fighting Group have issued a statement in which they declare an end to their support for the Armed Islamic Group. What is your position on them? A: Let all know that when we announced the jihad in God's path and went forth to fight the apostates, we did not rely on the support of anyone- whoever they may be from creation- but rather we believed that God the Exalted and Almighty is the One who supports us and helps us and gives us victory, as per the Almighty's words: "If you support God, He will support you and plant firm your feet" (Muhammad). And the Almighty's words: "If God supports you, no one can overcome you, and if He forsakes you, who is the one who can support you after Him?" (Al Imran). And the words of the Almighty and Exalted: "He is the One who has supported you with His victory and the believers." And He has also said: "And victory is only from God" (Al Imran). So we have only ever hoped for the support of God (Blessed and Almighty is He). Therefore we remind all who love jihad in God's path and support the Armed Islamic Group that the one who wages jihad, wages jihad for himself, and that supporting the mujahideen and helping them are an obligation on every Muslim proud of this blessed jihad and this is among the greatest signs of loyalty to God and the Sunna of His Messenger (SAWS) and his believing, mujahideen servants, so it is not for anyone to bless us, for God Almighty is the One who has blessed us as He has guided us to Islam and jihad in His path. So we, if God wills, comply with the Book and the Sunna and the Salafi manhaj. And we are not like the rest of the sects and organizations that do not comply with that, so praise be to god for that first and last. So we say to these two groups mentioned in the question. We do not care for you or your support. For as we began the jihad in the path of God Almighty, seeking the help of the Exalted, so we will remain by God's permission. The one who forsakes us does not harm us, nor the one who ceases to support us. And note that the Armed Islamic Group was offered material support and not merely moral support by some of the organizations, and it was embodied in furnishing it with weapons and ammunition and equipment and assisting it likewise with money, but the Armed Islamic Group rejected that because it complies with the law and will not deviate from it an inch, for we are not swayed by wealth and arms, and we will not sell our creed for the sake of that and we do not accept that anyone should barter with us in it, and we have a lesson in what happened in the abode of the Afghans when they deviated from the Book and the Sunna and the Salafi manhaj. The result was their division into factional followers, divisions and parties. Rightly applied to them are the words of the Almighty: "Let those who dissent from his order beware lest fitna should strike them or a painful torment should strike them"- al-Nur. So consider oh people of understanding. As for the Egyptian Jihad group, they have taken revenge against us for our frankness in responding to them as came in the message that my brother Abu Abd al-Rahman Amin (may God have mercy on him) sent to their amir: the message contained things that did not accord with their whims, among them that Sayyid Qutb (may God have mercy on him), despite the tribulations he endured, is not considered among the 'ulama of the Ahl al-Sunna because of what he believed from innovations and errors that are not hidden to anyone who reviews his books and works. So they responded strongly to us and became partisan for a person and not the truth just as the innovators of the madhhabists have been partisan for the imams of their madhhabs and like the partisanship of the innovators of the Sufis for their sheikhs and leaders. And they have taken revenge against us also for those frank pieces of advice that my brother Abu Abd al-Rahman Amin (may God have mercy on him) offered them. So when they wanted to announce this revenge of theirs, they found justifications that they invented and fabricated against us with no foundation for them from truth. Among them is that when my brother (may God have mercy on him) advised them to return to the path of the Companions (may God be pleased with them) in the conquest of Egypt on discussion of their work, they said this is among the signs of the Khawarij for they are the ones who do not consider fighting except by the sword and spear. And consider- may God have mercy on you- how they interpret the words and distort their meaning. For what our brother Abu Abd al-Rahman (may God have mercy on him) meant by this expression was dissuading them in their path of change, to quote them, and it is the path of the coup or what they call the comprehensive plan and its adoption of a manhaj for them. Then how do we advise this? And we, praise be to God, use all types of weapons and strive to acquire them by all legitimate means. The likes of these doubts that they place are lines of evidence and justifications for the likes of this action of theirs and beside this, for from the manhaj of the Jihad group is that it considers dealing with all the mujahid groups on the field according to their differences without distinguishing. Indeed they consider it necessary to deal with them and cooperate even with the sects that claim affiliation with Islam, all in its field for the sake of establishing an Islamic State, as their amir affirmed. And this contravenes the manhaj of the just predecessors (may God be pleased with them) from the Companions and the followers, and also contravening the ahadith of the division of the Ummah and the remaining of a sect that fights on the basis of this religion. But also it is part of the policy and way of the erroneous sects like the Ikhwan and their likes in bringing together and uniting the ranks not on the basis of the methodology of the Prophet and his companions. As for the Libyan Fighting Group: they sent a delegation to us and met the amir of the Armed Islamic Group our brother Abd al-Rahman Amin and they met with the Shari'i committee and they discussed many matters. It became clear after this discussion that this group- the Fighting Group- is Salafi on paper and tongue, but in reality they are totally removed from Salafism. Rather they are closest to the manhaj of the Muslim Brotherhood, for among the issues that make that clear is the issue of amirship. For they appoint the amir and remove him according to the circumstances and stages, so they may appoint an amir and then it may become apparent to them that the stage needs one besides him, so they remove him and appoint one besides him and so on. And likewise the Shura is bound on the madhhab of the Brotherhood and so too in that they are contravening what the predecessors and Imams were upon. And it is surprising that one of the delegates with them gave a lecture to the mujahideen in which he said that the isolated ahadith should not be invoked as proof texts in doctrine, on the basis of the assertion of the Mu'tazilites who use kalam. And another of them said that Abdullah ibn Mas'ud (may God be pleased with him) was extremist in adherence to the Sunna. Then it became apparent after our meeting with them that they are extreme in partisanship for Sayyid Qutb (may God have mercy on him) and in exchange for this they forsake the Sunna of the Messenger of God (SAWS) and are not bound to it, so how can these people be Salafis? Then they joined with the Djazarist innovators in the al-Arbia' area and this is among the greatest of loyalties to the people of innovation. Then their amir stated to us that he does not consider there to be an objection in dealing with the people of innovation. So what is this Salafism? It is Salafism of the tongue and pen, nothing else. Q: The Armed Islamic Group accustomed us in the time of the brother Abu Abd al-Rahman Amin to its bold and frank stances towards France and other countries of kufr that support these apostate Tawagheet. Has any chance come upon these stances? A: God Almighty says: "Fighting has been prescribed for you and you dislike it. And perhaps you dislike something that is good for you and perhaps you like something that is bad for you. And God knows and you do not know"- (al-Baqara). The positions and principles of the Armed Islamic Group are not derived from stage or changeable interest, but rather it derives that from the Book and Sunna on the understanding of the just predecessors (may God be pleased with them) and this issue is among those. For our position on France and the likes of them is a Shari'i stance, not one of rational interest as some think. The Almighty has said: "Fight those adjacent to you from the disbelievers, and let them find harshness in you"- (al-Tawba). And it is well-known that France has brought all the reasons that necessitate fighting it from waging war on the Muslims and supporting the apostates openly, and this matter continues until now, and thus our position on France is the same positon as our brothers who preceded us like Ja'afar and Abu Abdullah and Abu Abd al-Rahman Amin (may God have mercy on them) and it is well-known that we strive to establish the Caliphate on the Prophetic Methodology and this will only be through implementing the Almighty's words: "And fight them until there is no more fitna and religion is entirely for God"- (al-Tawba). And the words of SAWS: "I have been ordered to fight the people until they bear witness that there is no deity but God and that Muhammad is the Messenger of God and they establish prayer and zakat..." (the hadith). And the Almighty has said: "He is the One who sent His Messenger with guidance and the religion of truth to make it supreme over religion entirely, even if the disbelievers hate it"- (al-Saff). And that will only be through overcoming the disbelievers, and implementing the rulings of Islam openly and obliging all by them and subjection to them, and God knows best. A: Lastly I all on my Salafi mujahideen brothers (and God bears witness that I love them) in God Almighty to implement the Book and Sunna and comply with the Salafi manhaj in word and deed, externally and internally. And I call on them to embrace patience and steadfastness on the path of jihad in God's path and not to be perturbed and impacted by what is happening in the field of jihad, especially after the appearance of the renegade innovators from whose evil God has protected us by their revolt against the group and distinguishing them. And this is a grace from God Almighty, and know oh beloved mujahideen that Paradise is surrounded with disagreeable things as came in the hadith of the Prophet (SAWS): "Paradise is surrounded with disagreeable things, while Hellfire is surrounded with pleasant things." And as for these innovators who have turned on the group and the ill-hearted, they have gathered on one matter: and that is stopping this blessed jihad. For their objective is one and that is dialogue with the apostates in order to return to what they were upon before and that is seeking refuge behind this material world and its delectations and delights. And the affair of these renegades is like the affair of the hypocrites who secretly harm us and attack us as they were in the ranks of the group. But God has protected us from their evil by their appearance and their desertion, so we have known from which side we were being stung. So praise and blessing be to God. And we have in the Messenger of God (SAWS) the good example, for SAWS was harmed by the hypocrites and they attacked his honour, and despite that harm and slander, SAWS was not impacted but rather that increased his determination and that did not divert him from waging jihad against the disbelievers and hypocrites, as per the Almighty's words: "Oh Prophet, wage jihad against the disbelievers and hypocrites and be harsh with them. Their abode is Hellfire, and evil it as destination"- (al-Tawba). And know oh mujahideen brothers that victory is with patience and that deliverance is with worries and that with adversity is ease as per the words of SAWS: "...And know that what has come to you could not miss you, and what has missed you could not come to you. The pens have been raised and the pages filled in"- (narrated by al-Tirmidhi on the authority of Ibn Abbas with an authentic chain). And in a narration: "And know that victory is with patience and deliverance is with worries and that ease is with adversity"- (the hadith). And I call on my mujahideen brothers not to listen to every treacherous, hypocritical screeching person, and listen and obey the Almighty's words: "Had they gone forth with you, they would only have increased your confusion, and they would have been active among you, seeking fitna among you. And among you are those who listen to them"- al-Tawba. So do not (may God have mercy on you) be among those who listen to these deceptive traitors, and know for certainty that God has deceived them and they will never succeed. I advise my mujahideen brothers and their supports to return to the Book of God and ponder the Almighty's words: "Oh you who have believed, if a gravely immoral person comes to you with news, investigate, lest you harm a people unknowingly and you become regretful over what you have done"- al-Hajarat. So if this came down with regards to a companion of the Prophet, what is the wrong with you with the one besides him, especially these heretics who are not even good at lying? So you must investigate and be certain and do not forget that your brothers who are at the head of the Armed Islamic Group are well-known from before and their state is well-known, for God has ennobled them by the grace of precedence and good performance and they are well-known for their adherence to the Book and Sunna and their following of the guidance of the predecessors of the Ummah (may God be pleased with them). So they are not misled by the rebellion of foolish people who are only good at speaking affectedly and seducing the masses whom God has not ennobled by the grace with which He has ennobled our brothers who are the notables of this blessed group. Indeed it is well-known about them that they are cowardly weaklings, so be of good thought and always return on your conflict in something to the Book and the Sunna as per the Almighty's words: "So if you dispute something, refer it to God and the Messenger"- (al-Nisa'). And remember, dear brothers, how these fools, who claim the Sunna and anoint themselves with Salafism, betrayed your amir Abu Abd al-Rahman Amin (may God have mercy on him) and whose courage and initiative in the deeds in which he participated you all bear witness to. And they bear witness to that. So be among the clever, intelligent ones who cannot be easily deceived. And know for certainty that those who betrayed our brother Abu Abd al-Rahman Amin, nullified their allegiance, broke their faith and nullified the covenants will meet their reward in this world before the Hereafter and the days between us. And SAWS said as in the two authentic collections: "The banner of treachery will be erected on the Day of Judgment, so it will be said: this is the treachery of so-and-so son of so-and-so." And how great is the treachery against Imams and amirs. And they accuse us of being Khawarij and they are more deserving of that and the evidence is they are the ones in whose ranks is found one of the heads of al-Hijra wa al-Takfir, not we, so wake up, oh mujahideen brothers. And I return and remind my brothers in God from the mujahideen and the supporters of the Almighty's words: "Do not despair and do not be sad, and you are the supreme ones if you are believers"- (Al Imran). For we believe in God's promise to us of His victory. Thus no one will be able to divert our determination or impede us: either victory or paradise. And we have- praise be to God- men who can succeed us so the fighting will not stop if God wills until the rise of the Hour. My Salafi mujahideen brothers, destroy the heads of the Khawarij, the Djazarists and their likes. Disperse them in the land, uproot them and kill them wherever you find them. For there is a great reward for the one who kills them. And as came in the authentic hadith: "Blessed is the one who kills them and is killed by them." And they are the ones about whom SAWS said: "They kill the people of Islam and leave alone the people of idols." Oh dear brothers, you must massacre the apostate Tawagheet and the original disbeliever, and do not betray and do not alter. And remember the words of God Almighty: "Oh you who have believed, do not betray God and the Messenger or betray your trusts, and you know well"- (al-Anfal). And be firm on the pact and be with the truthful ones about whom the Exalted and Almighty has said: "Among the believers are men who have fulfilled what they have pledged to God, so among them is the one who has fulfilled his vow and the one who awaits. And they have not altered anything. God will reward those who have been true for their honesty and will punish the hypocrites if He wills, or He will accept their repentance. Indeed God has been forgiving, merciful" (al-Ahzab). So you, oh mujahideen, must destroy, slaughter and massacre- for destruction is destruction and blood is blood- until we enable God's religion in the land. Ibn Abbas (may God be pleased with him) said: "Kill the idolaters in al-hall and al-haram, and take them prisoner. And you must kill and massacre, and you must lie in wait and disturb them until they answer to God's ruling. And prevent them from moving about in the land and set in place for them every point to observe them." And know that so long as idolatry remains and religion is not entirely for God, we will continue fighting in God's path until God alone is worshipped without a partner for Him and religion is entirely for God as the Almighty has said: "And fight them until there is no more fitna and religion is entirely for God." So no dialogue, truce, reconciliation or dhimma pact with the apostates. Exalted are you, oh God, and by Your praise. I bear witness that there is no deity but You. I ask for Your forgiveness and I repent to You.